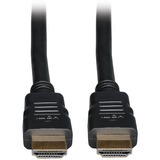 The P569-001-FF-APM Panel Mount High-Speed HDMI Cable with Ethernet extends your HDMI interface to add a female HDMI port to the front panel of a computer, a trade show booth, retail kiosk or teacher's or lecturer's podium. 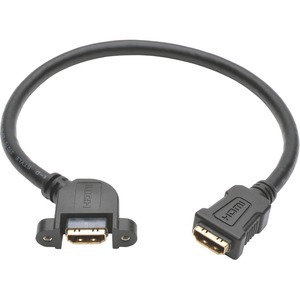 This allows you to conveniently connect a Blu-ray™ player or other HDMI device to use in presentations, lectures, trade shows or digital signage. 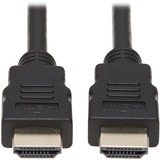 Connect the opposite female HDMI port to an HDMI cable attached to a monitor, projector or HDTV. 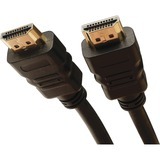 The one-foot cable features gold-plated connectors that resist corrosion and ensure optimal signal transfer. Shielded 28 AWG wire offers reliable error-free communication. PVC jacket with molded connectors and integral strain relief provides durability and long life. Mounting hardware included.